This post is the next in a series on the use of lousewort (Pedicularis lanceolata) a hemiparasitic plant common in wetlands, to increase species diversity. At the edge of our wetland the sedge Carex trichocarpa was forming very dense monospecific stands. Because of the sedge, no other species were able to get established. In 2009 I discovered that lousewort was starting to move into these Carex stands. Lousewort is known to parasitize sedges. The hope was that this action would open up the site so that other species could become established. Therefore we collected lots of lousewort seeds and planted them in the large Carex patches. By 2011 the lousewort was beginning to have its effect. The Carex had been knocked back and other species were beginning to be established. Over the next two years we continued to plant lousewort seeds in more Carex areas, with good effect. This spring all these Carex areas were burned as part of our major wetland burn. By now the Carex has almost disappeared (see photo below) and a wide variety of wet mesic prairie species have become established. 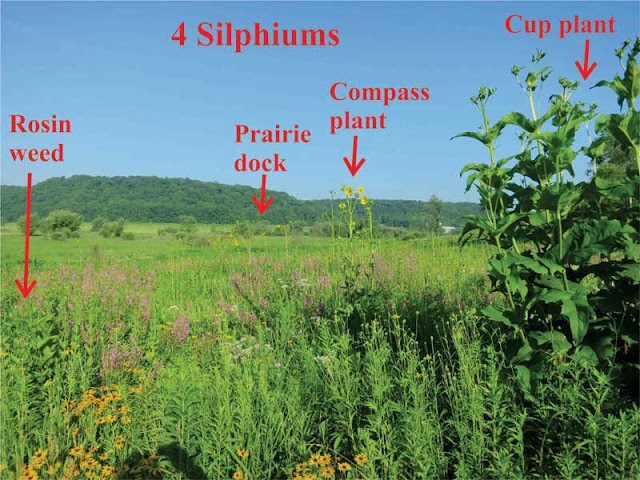 Species here include Baptisia alba, Pycnanthemum virginianum, Silphium perfoliatum, Rudbeckia hirta, R. laciniata, and Veronicastrum virginicum. We have lots of lousewort growing at the edge of our wetland, and the seeds are easy to collect and plant. Thus, it is quite easy to use this technique to increase species diversity. Compass plant (Silphium laciniatum) is a classic prairie species which does best in mesic habitats. Because it is deep rooted, loam soils (such as the black soils of Illinois) are especially suitable. Although it grows well from seed, the first few years at a site it grows only vegetatively. 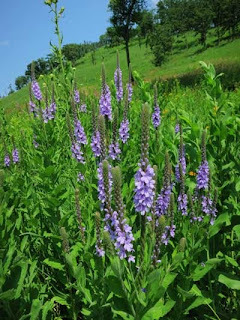 Except in unusually favorable locations, it requires five or six years to flower. Once well established, it is long lived. Here are two examples of compass plant developing outside its principle habitat. Our south-facing slope at Pleasant Valley Conservancy is very rocky. It is impossible to dig with a shovel and stakes and rods cannot be installed. Soil is practically nonexistent. The principle species in this prairie remnant is little bluestem, a very shallow-rooted grass. However, this year we have five or six compass plants in full bloom scattered across the slope. How do they manage it? The bedrock here is Tunnel City sandstone, which the hydrogeologists tell us is a high permeability rock that is an important source of water for the Wonewoc aquifer. Presumably, compass plant is able to send roots down through this fractured rock, following vertical fissures, until it reaches a water supply. Although we have had scattered nonflowering plants for some years, this is the first year we have seen many flowering plants. Presumably the high rainfall has helped make the difference. The other example is illustrated in the photo below. This compass plant seems to be thriving in deep shade under a shagbark hickory. The tree is growing at the edge of a fairly open oak savanna. All the other compass plants in this savanna are in full sunlight. 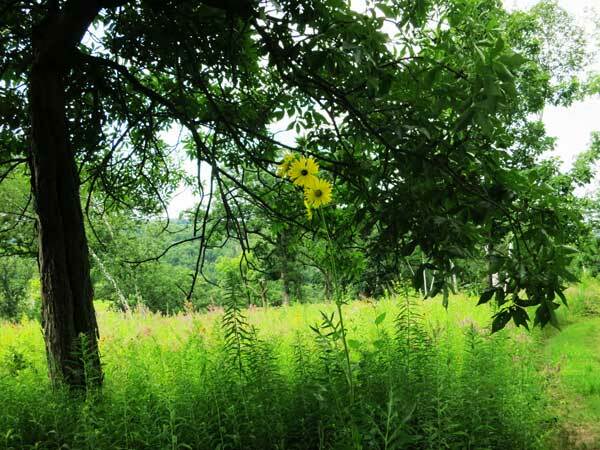 Note that the tree is south of the compass plant so that the only open area is north-facing. This plant will almost never be in full sunlight. The size of this tree shows that it has been here a fairly long time, so the plant has come up under the shade. Obviously, this compass plant does not need full sun to develop. I suspect the reason this species is not found more often in shady environments is because it is unable to compete with other species. This year weather conditions have been outstanding for prairie and savanna development. It will probably be a long time before we get another year like it. Enjoy! 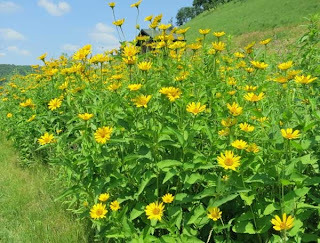 There are four species of Silphium that grow in our area, and right now they are all in flower. Although each has somewhat different requirements, all four are present in some of our prairies. In the photo they are growing side by side. Compass plant flowers the earliest. 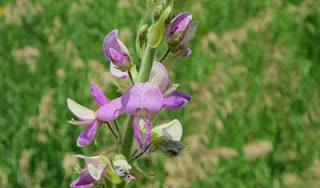 This is the classic prairie plant, found in the logo of The Prairie Enthusiasts. (This organization even has a Compass Club!) Very deep rooted, in favorable conditions it grows very tall. Although its prime habitat is mesic habitats, it is also found in dry, dry-mesic and wet-mesic areas. At Pleasant Valley Conservancy it even blooms on our dry south-facing slope as well as on our open savannas. Prairie dock only has basal leaves, which are often quite large. 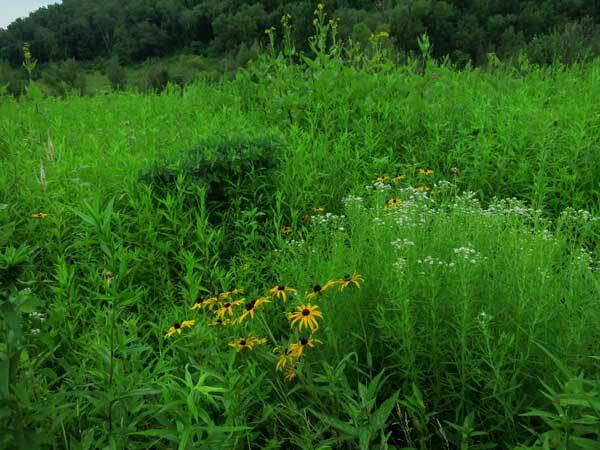 Although its habitat is supposed to be wet to wet mesic, we also have it growing in two dry sites, one prairie, the other savanna. Cup plant is the largest and leafiest, with perfoliate leaves that catch water at the nodes. Its habitat is wet to wet mesic, although we also have it growing on a dry mesic savanna. Rosin weed is the smallest species, and the latest to bloom. As its Latin species name indicates, its leaves are entire. It is a common member of dry prairies. Compass plant and prairie dock are known to hybridize. The hybrid grows like prairie dock but has cut leaves like compass plant. All four species grow well from seed, although it may take a few years before they are well established. However, once established, they should be constant members of the local flora. No prairie should be without them! Lots of bad or undesirable plant species spread vegetatively by underground rhizomes or stolens, and they are some of the worst plants to get rid of. Because their growth processes are occurring underground, it is hard to appreciate just what is going on. Many of the species that are rhizomatous send up new shoots from underground buds, a process called root suckering. Where you see root suckers, you know there are hidden rhizomes. Common milkweed (Asclepias syriaca) is a good example of a clonal species. Although the butterflies love it, and many people plant it to encourage Monarchs, it is a plant that can easily get out of hand. The photo here provides an interesting example of how this species grows. The large plant in the background is growing at the edge of a mowed lawn. This lawn was mowed about a week before the photo was taken. Four root suckers are visible, each of which could make a new clone. Since each new shoot can send out its own rhizomes, it would not take long to cover a large area. Although the shoots represent growth in the last week, the rhizomes may have been growing for many weeks under the lawn. 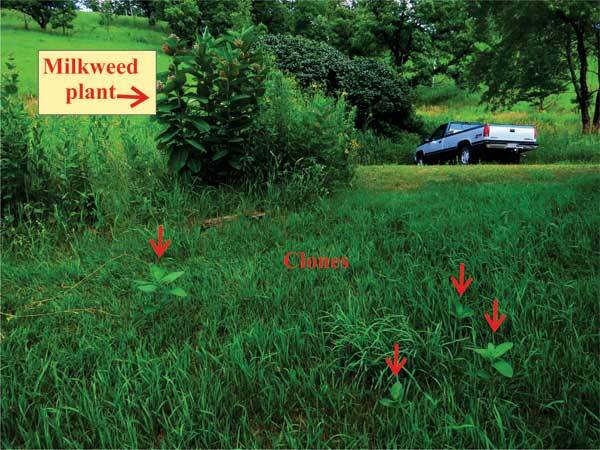 Milkweed shows the "guerrilla" type of clonal growth. Other species that grow in this fashion are aspen and sumac. The other growth type, phalanx growth, shows a tight advancing front. Canada goldenrod is good example of this type of clonal growth. See this post for a discussion of guerrilla and phalanx growth patterns. 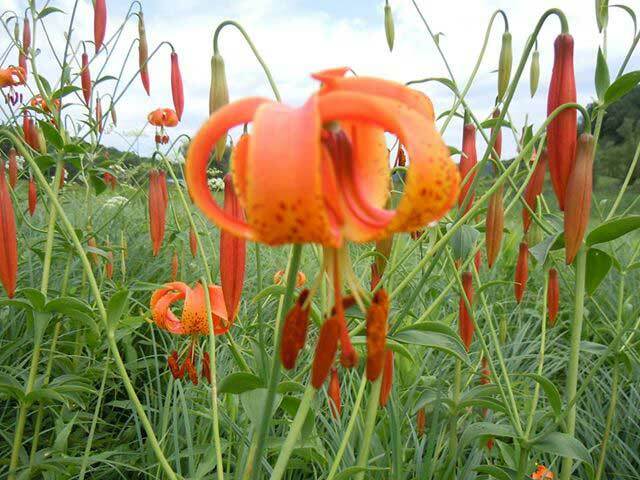 The turk's cap (Lilium michiganese) lilies in our wetland areas show remarkable responses to fire. In years that we don't burn, there are always a few lilies in flower, but most of the populations either don't flower at all, or make only a few short flowers. But the response when we burn is fantastic. This year, undoubtedly because of our major wetland burn, the lily populations are the greatest we have ever seen. Last year the population in the photo below had about 20 flower heads. This year we have over 200! And up and down the wetland edge there are large or small populations, many of which are not even seen in a year without fire. Turk's cap lily population responding to fire. 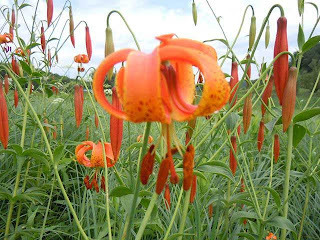 Also called Michigan lily. Most of our turk's cap lily populations grow in and among lush sedge meadows. I assume that the fire gets rid of last year's thatch, thus giving the lilies a head start. According to the UW-Madison Herbarium, this lily has been found throughout most of Wisconsin, but it is now becoming rare due to habitat loss. The consistent rains have been a boon to prairie plants and the fields are the most colorful they have been in many years. I made a list yesterday of species that are in full bloom at Pleasant Valley Conservancy right now. 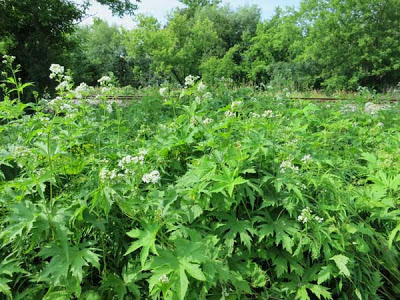 Right now is a favorable time for assessing populations of glade mallow (Napaea dioica), our only midwestern endemic. I had a post a few years ago about the tragedy that happened with the large roadside population along U.S. 14. Although about 70% of this population was lost, the remaining stand that Kathie was able to save (mostly along the railroad near Kahl Road) is doing quite well this year. In addition to Napaea's interest as an endemic, it is monotypic (the only species in its genus), dioecious (the only species in its family with separate male and female plants), and lacking any close relatives. Although uncommon, it is a robust plant, quite easy to cultivate in a garden. (We have a couple of volunteers that are doing quite well in the small garden in front of our house.) The confusion about its taxonomy that had existed since Linnaeus' time was straightened out by UW-Madison botanist Hugh Iltis in the 1960s (American Midland Naturalist, Vol. 70, pp. 90-109). The population along U.S. 14 was first described by Norman Fassett in 1942 (Torreya Vol. 42, pp. 179-181). The photo below shows a typical stand. Although not seen in the photo, Black Earth Creek is on the other side of the shrub layer. Robust population of Napaea dioica growing between U.S. 14 and the railroad. In addition to the large Kahl Road population, there are several large populations growing along the Creek west of the Village of Black Earth. I have also seen small populations along East Blue Mounds Creek, a tributary of Black Earth Creek. The population near Mount Horeb that Iltis studied in 1963 has probably been wiped out by new road construction. Most sites where Napaea has been found are along stream banks and floodplains of small to medium-sized streams. Iltis considered that its sun-loving nature indicated that it was a wet prairie species. When we first started restoration at Pleasant Valley Conservancy we had a small population growing along our marsh edge, from which we collected seeds. 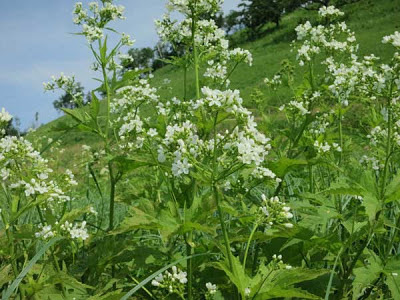 When we planted the Crane Prairie in 2005 we made a special effort to include Napaea in our seed mix. It has done well there, being found mostly in the wet-mesic part of the Prairie. It has also spread on its own to other areas along the marsh edge. The photo below shows a typical stand. It is not clear why this species is endemic. Although it is not quite as restricted as Iltis believed, according to the USDA database it is found only in DC, IA, IL, IN. MN, OH, PA, VA, VT, and WI. In most of these states there are only a few collections. The largest collections have been from Illinois and Wisconsin. Although it is not on the state list in Wisconsin, it is listed as Threatened in Minnesota. Seeds are available from several suppliers for those who would like to try it in a garden or wet prairie planting. This is peak season for butterfly milkweed (Asclepias tuberosa). Rettenmund Prairie has a huge number of plants, with quite a wide variation in color, but none pure yellow. I discussed Woodford's work in a post last year that showed that color in this species is due to a combination of yellow carotenoids and red anthocyanins. Some populations in Minnesota and southwestern United States seem to completely lack the reds and are pure yellow. As far as I know, yellow populations have not previously been reported in Wisconsin. 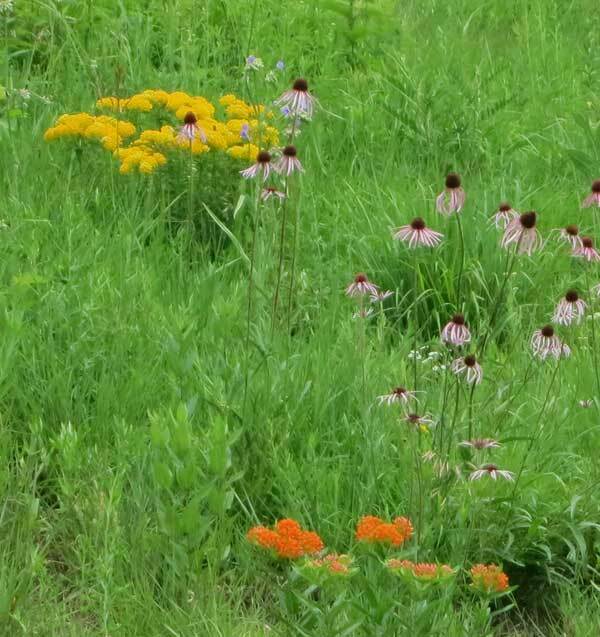 Last year Kathie found a yellow butterflyweed in one of our planted prairies (the Pocket Prairie) and this year another of the same color has shown up in a remnant prairie (Unit 7) nearby. Adjacent, as the photo shows, is the more typical red-orange variety. Woodson's work on the biogeography of color variation in butterflyweed is fascinating. With a group of graduate students, he drove over 45,000 miles in eastern and central United States, on the lookout for roadside populations. Flower color varied strikingly in different parts of the country. The yellow varieties were found primarily in the southwest, although also in Minnesota. Woodson, who was based in St. Louis, discusses one drive he made along Route 66 between St. Louis and Oklahoma City. Somewhere in western Missouri flower color made a sharp change from red to yellow. "When I first encountered it in 1958, along old U. S. Highway 66 between Joplin, Missouri, and Oklahoma City-a single day's drive of only 260 miles-I could scarcely believe my eyes. The variation...is amazing. West of Oklahoma City the yellows pre- dominate..."
Visually Woodson quantified the flower colors by means of a standard color chart, and followed this up in the lab with spectrophotometric measurements of extracted pigments. The latter provided a neat way of comparing different populations. The photo here, taken from his paper in Evolution, shows the comparison. 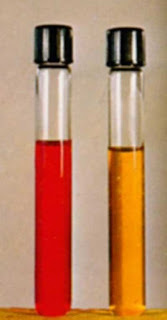 The two pigment types could be separated by extraction, since the carotenoids are water insoluble but soluble in methanol, whereas the anthocyanins are water soluble and extractable with dilute hydrochloric acid. Although no genetics has been done, it seems reasonable that pigment concentration and hence flower color are genetically controlled. To see quite a range of flower colors in butterfly weed (although not the yellow), take a stroll right now through Rettenmund Prairie.